Plant AssistTM is a specially blended soil additive to support newly planted tube stock and plants through the critical establishment period. 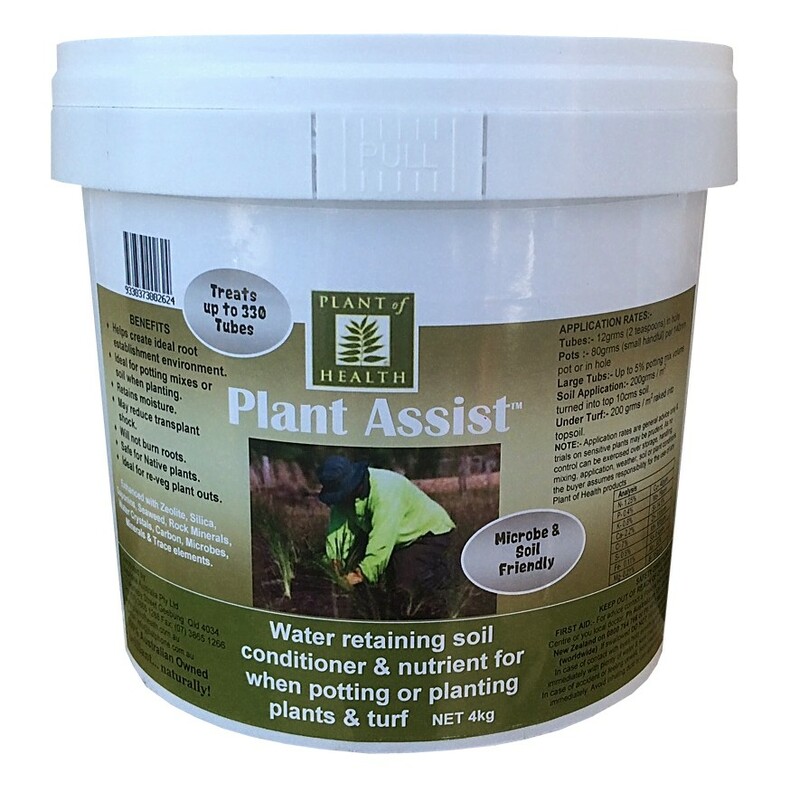 Plant AssistTM is a brilliant new product that incorporates soil & microbe friendly nutrients as well as organic water saving inputs that will provide an environment to give plants the best possible chance of establishing in all type of soil conditions. The high carbon base means that the product will have ample food for the biomass to establish around the root zone of the plants while also providing nutrient for the early stages of growth, with limited chance of burn. The silica rich, diatomaceous earth input, retains water while supplying silica for the plant: a known plant cell strengthener as well as a pathway for nutrient into the root. Added zeolites further retain water and house all important microbes while not affecting the hydraulic conductivity of the soil in heavy conditions. Microbes, including mycorrhiza fungi & trichoderma help support and protect the root system and assist in supplying nutrient from beyond the root zone. Kelp, containing alginates and natural growth hormones, not only support cell division and reduce transplant shock but also holds many times its weight in water to further assist the new plantings. Water crystals and a natural surfactant, derived from saponins, completes this sophisticated product. Plant AssistTM is a cost effective product that can be used on all plants, natives, tubes, turf, in pots, or in the ground. ¨ Helps create ideal root establishment environment. ¨ Ideal for potting mixes or soil when planting. ¨ May reduce transplant shock. ¨ Will not burn roots. ¨ Safe for Native plants. Tubes:- 12grms (2 teaspoons) in hole. Soil Application:- 200grms / m2 turned into top 10cms soil. Under Turf:- 200 grms / m2 raked into topsoil.